Blowout Sale! 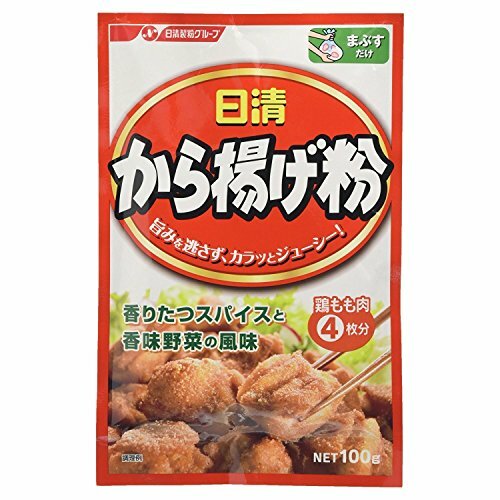 Save 58% on the [With Original Easy recipe ''How to make Karaage'' ]Nissin Foods ''KARAAGE'', Japanese Style Fried Chicken powder 100g by Nissin foods at Smokey Robinson Foods. Hurry! Limited time offer. Offer valid only while supplies last. With Original Easy recipe "How to make Karaage"
Spice and flavorful deep taste of vegetables. It is easy to use as much as you want, a powder type. View More In Salt & Salt Substitutes. If you have any questions about this product by Nissin foods, contact us by completing and submitting the form below. If you are looking for a specif part number, please include it with your message. Black Tai Salt Co's - (Food Grade) Himalayan Crystal Salt - Coarse - 30 Lbs -- 2.0-3.5mm (peppercorn size) Freshness Guaranteed! Authenticity Guaranteed! Scott's, Santa Maria Style Seasoning, 7 oz. Cargill Purified Untreated Sea Salt, 50 Pound - 1 each. Black Tai Salt Co's - (Food Grade) Himalayan Crystal Salt - Fine - 30 Lbs -- 0.5-1mm (like table salt) Freshness Guaranteed! Authenticity Guaranteed!